As a topic for discussion and policymaking, climate change and its consequences have moved from abstract science in the 1970s to the brink of desperation in the 2010s. 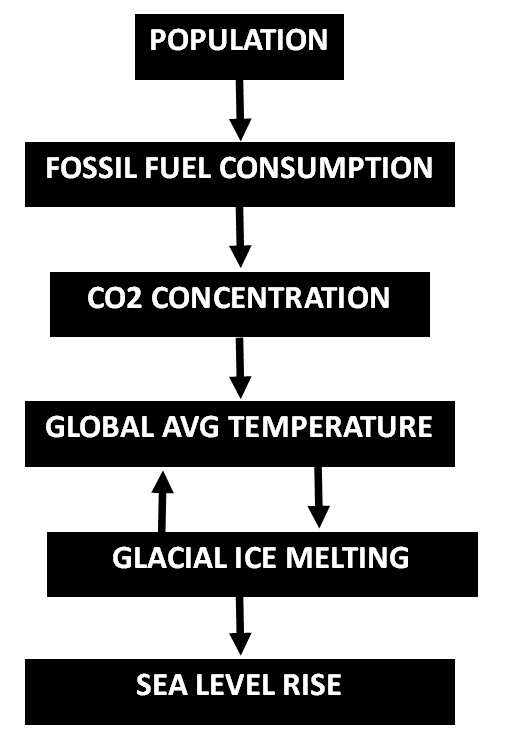 The sequence of some relationships behind climate change is shown in the diagram accompanying this column. In the diagram, I have put rising sea levels where they belong: as the most threatening aspect of this crisis that threatens to submerge some of the most valuable real estate – in the U.S. and entire vulnerable nations in Southeast Asia – under several meters of water by the end of this century. More than a billion people could be driven from their land, dwarfing recent problems with refugees and every other humanitarian disaster in world history combined. In a world full of inexpensive fossil fuels, ask the growing, mobility-conscious populations of Africa, China and India to accept permanent poverty rather than drive on the same road to prosperity enjoyed by North America and Europe. Build sea walls to protect vulnerable coastal areas like Miami and New Orleans when history makes it clear such walls are destined to be breached. Even if various efforts to modify economic behavior worldwide did reduce CO2 levels back down to 250 parts per million, it would take thousands of years or longer to get the excess seawater stored in ice sheets on Greenland and Antarctica. This is the crux of the crisis of rising sea levels. Furthermore, per the feedback indicated in the diagram, reducing CO2 levels is not going to reverse the melting of ice for decades. Sea levels will continue to rise, perhaps also for hundreds or thousands of years. The residents of lower Manhattan, Miami and Bangladesh do not have that time to give. We need to absorb the point that Harvard biologist E.O. Wilson made in his 1998 masterwork, Consilience: The Unity of Knowledge. Around the end of the 1800s, and without any recognition at the time, the human population crossed a line that made sustaining itself impossible without technology. From that time forward, technology became a necessary prosthesis. Abandoning that prosthesis, for instance as it pertains to food production, would result in massive starvation and horrific loss of life. There is no turning back for the 7 billion persons alive today. We have to embrace technological solutions to the difficulties caused by our population or condemn billions of persons to death. Now back to the rising sea levels. Wilson’s point means that we need to make a massive investment in geo-engineering technology to manage those levels. Having demonstrated an unprecedented capacity for huge technology projects in the 1940s with the building of the atom bomb and in the 1960s with the crewed missions to the moon, we need to harness the abilities of the federal government to address rising sea levels. It is time for the government to take the lead on Project Earth, the dynamic management of climate change impacts. There is no other force of its power and resources that is up to the job at hand. Imagine that a component of Project Earth would be to pump the excess water back onto land for use and storage. A back-of-the-envelope calculation regarding this technological approach to sea level rise is as follows. The oceans are rising at a rate of 3.2 x 10-6 kilometers per year and the area of the oceans is 360 million kilometers squared. The volume of water melting into the oceans is 1,150 cubic kilometers per year. Large desalinization plants can process 0.14 cubic kilometers of seawater per year. It would take about 8,000 such plants to reduce global sea levels even as the melting of glacial ice continued. Omitting Antarctica that would require one plant on average every 75 kilometers of seacoast worldwide, and cost about $4 trillion to build. That price tag is less than the U.S. has spent building its nuclear weapons stockpile. Here is the kicker. Yes, it would be expensive. But the cost is justified entirely by the value of the real estate in the U.S. alone that otherwise will be submerged. In other words, if the U.S. built the 8,000 desalinization plants around the world, its residents would be better off even if no other nation assisted. Think of the benefits worldwide to producing that much fresh water for use in agriculture, industry and homes. We could convert the Sahara, the Gobi and other deserts to arable land. It would be possible to completely end the scourges of illnesses that sicken and kill millions of people without access to potable water. Droughts would be a thing of the past. All of these benefits are just side effects of using technology to prevent a global catastrophe caused by the relentlessly rising seas. Our government can do this. Let’s make it so! Don’t stand in the doorways or block up the halls: we are getting soaked to the bone. Author: Erik Devereux has worked for 25 years in the public policy and management field. Erik currently is an independent consultant to nonprofit organizations and higher education and teaches applied policy analysis at American University. He has a B.S. from the Massachusetts Institute of Technology (Political Science, 1985) and a Ph.D. from the University of Texas at Austin (Government, 1993). Email: [email protected]. An update on desalinization technology: Israel now has a state-of-the-art plant that can process 0.23 cubic kilometers of sea water per year. If similar plants were built worldwide, it would require 5,000 rather than 8,000 such facilities to manage sea level rise with one located on average every 120 kilometers of coastline outside Antarctica. This would not solve the problem of sea level rise immediately but it could help to cool down the Earth over time while saving the Arctic habitat from further degredation.